Mandy's new kidney allowed her to function for 18 years but it has recently started to decline and she was told she would need another transplant. However, Mandy's consultant told her about the UK Living Kidney Sharing Scheme, which has been running for more than a decade. "It is where couples like us can be paired up and help each other out," says Mandy. "My brilliant husband didn't hesitate for a moment. "I tried desperately to talk him out of it but he was having none of it." It is a logistical challenge, according to Sarah Lundie, the coordinator at Edinburgh's Royal Infirmary. Graham says: "Getting to this morning with everyone fit and healthy and ready to go is a great relief." 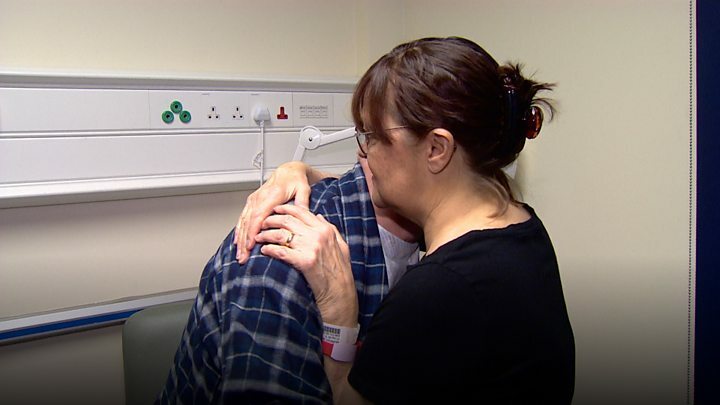 His wife Mandy, 57, says they have felt the "responsibility" of keeping well in the weeks before the operations so that the donor sharing chain would not be broken. She says: "Graham and I decided to sequester ourselves in our house, get our shopping delivered and really try not to catch anything so we could make sure that bond could be maintained." "I'm thinking about the donor rather than the recipient," he says. "The focus with donors is operating safely and meticulously. The risk to donors is actually very small." "That offers an extra element of control and safety," Mr Terrace says. "The first 80% is moving things out of the way, moving the liver and the bowel and identifying the kidney and the structures that go into it and come out - the vein, the artery and ureter." He says these are then prepared so the kidney can be removed quickly but still be suitable for "reimplantation" into the recipient. Mandy's kidney surgery is performed by consultant Sorina Cornateanu. After successfully operating on Mandy, Ms Cornateanu describes her team as the "vehicles" between the donor and the recipient. "That's our role. It is fulfilling, rewarding, humbling and it is a big relief at this stage." "It has been a big team effort from all of us and we need to sustain that. That's the challenge." Another form of living donation is "altruistic". Over the past 10 years, 78 people in Scotland have donated a kidney to a stranger. Graham said: "That's fantastic. We never expected to know." "I'm so pleased," said Mandy.